Umm. the biscuit and gravy is calling my name right now and my son loves all things organges- fruit, veggies you name it! Have a great weekend! i am still on the lookout for the SOLD OUT shattered polish from the Katy Perry OPI line! Its because of you that I am so trendy! lol. Hey! Thanks for stopping by :) I love that decorative soap! It looks like so much fun!!! And the names of the OPIs are soooo much fun! hahaha. Love the new OPI colors! I just love the vintage look on the vanity. I was going to do my bathroom in that sort of look but went with a simpler look. 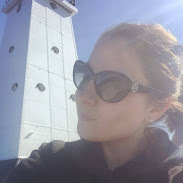 Have a great weekend, Erica! I need to check out this OPI collection! i need those opi colours! 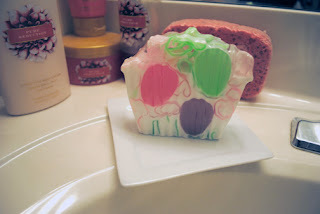 i love that decorative soap - totally thought it was a cupcake! Love that decorative soap and the nail polish is so pretty! I'm loving the first one. Are those sweet potato fries?! Love those!! I only sometimes like the real light colors (on occasion they look prettier in the bottle than on the nails)...but I really want to try the In the Spot-Light Pink!! Loving the pastel polish! I'm definitely in favor of the lighter colors for spring. I love those flirty, feminine OPI shades! So soft and gorgeous. Oohhhh, I love these new OPI colors. Getting new nail polish is one of my fave things to do! Lunch looks delish by the way. We're trying to eat healthier and fresher at our house. Thanks for stopping by my blog and leaving such a sweet comment! This is the first I'm hearing of the Femme de Cirque collection. I need to have that shimmery top coat, as well as the pretty Step Right Up! color. I'm with you and like my light colors in the warmer months.